In Aliens: Colonial Marines, players experience what happened after James Cameron’s film Aliens. In the game, United States Colonial Marines have been assigned the task of investigating a distress beacon sent from the USS Sulaco, which is in orbit around planet LV-426. Aboard the USS Sephora, the United States Colonial Marines arrive at their destination, players will take on the role of Cpl. Christopher Winter as he and his team are sent over for a search and rescue mission aboard the USS Sulaco. The Colonial Marines do not find any survivors, however they do find something much more sinister: Xenomorphs. After a Xenomorph attacks kills several Marines, remaining Marines are sent into the ship to find any information about what happened to the crew aboard the Sulaco and why the ship is abandoned with a Xenomorph infestation. The Marines soon make a startling discovery. They uncover Weyland-Yutani equipment and evidence of experiments done by Weyland-Yutani on Marines aboard the Sulaco. It only gets worse as the Marines soon find Weyland-Yutani mercenaries are still aboard the Sulaco. The mercenaries attack the Sephora, causing the ship to crash into the Sulaco, destroying both ships in the process. All remaining Marines are told to group at the Hadley’s Hope colony remains on planet LV-426. It’s up to them to discover the truth behind Weyland-Yutani’s plans while fighting for their lives among the Xenomorph attacks on the planet. Aliens: Colonial Marines features standard first-person shooter combat. Players can switch between a main weapon, a secondary weapon, and a pistol in combat. There are only a few weapons to choose from in the game and they can be switched out at any point during gameplay. Weapons are limited to assault rifles and shotguns as well as the standard pistol though, not much variety is featured in the weapon system. The control layout is non-uniform when it comes to switching weapons in combat on consoles, the d-pad is used to equip the pistol as well as the flashlight and the Y or triangle button is used for the other two weapons. This makes switching weapons around in combat a little tricky at times. There is a melee option for when the player faces and enemy up close, it’s used to shove Xenomorphs off when they attach to a character and must be done at the right time or death of the character is imminent. Melee can also be used against human enemies but since the human AI tends to run away from combat to find cover it becomes more efficient to simply shoot them. The AI enemies display broken movement animations and will, at times, slide into rooms sideways and get stuck in floors, walls, and staircases. This makes killing the enemy either very easy, as they will stand still or face walls, or very difficult since when they are stuck inside floors and walls it is next to impossible to kill them due to only a small piece of their bodies being exposed. There is a weapon upgrade system featured in Aliens: Colonial Marines. It is surprisingly detailed, allowing players to choose everything from which sight is on their gun to what secondary fire mode is equipped on each gun. The downside is that not many of the upgrades actually make the gun more powerful or efficient, most of the upgrades are merely player preference or cosmetic in nature. XP can be earned by killing enemies, completing levels, picking up collectibles, and performing special tasks highlighted in the game’s pause menu. The XP is used to level your character up and each level unlocks points to use in weapon customization. This game does feature both single player and cooperative campaigns as well as competitive multiplayer. Players can play alone or with friends through the story and multiplayer modes. Playing through the campaign with a friend can be beneficial, when a player is taken down by an enemy a friend can pick them up avoiding death and having to restart at the last checkpoint. This game suffers in both visuals and presentation. The graphical content is awful, featuring horrid textures and poor facial animations. The environments in the game are well done visually but tend to be ruined by the poor graphics and bad resolution/textures. The hud as well as words displayed on the screen seem to be intentionally styled to look as if they are from the Aliens movie, the problem is the color scheme – which is light blue. The color along with the text size, even on an HD television, make everything hard to see and read. 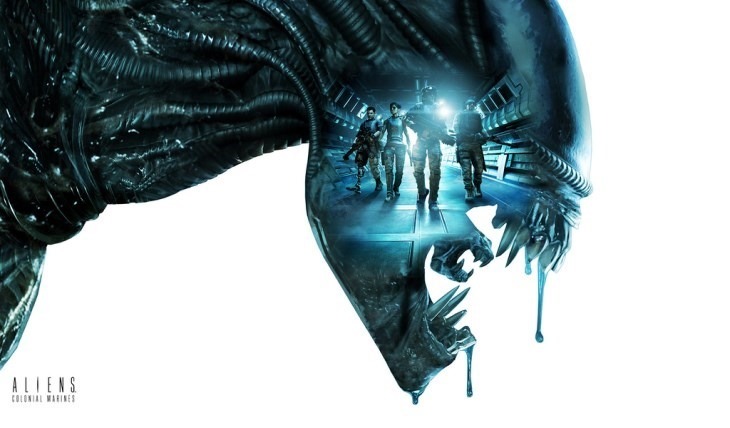 Aliens: Colonial Marines offers up tutorials to help players learn all aspects of the gameplay early on in the game, but these tutorials tend to be less beneficial than the typical game tutorial Tutorial messages stop the gameplay and take over the screen only disappearing as soon as the player performs the task that is being shown or by pressing the action button. Placed at poor moments of gameplay such as in combat or while performing a special task, the tutorials are more invasive than helpful. Xenomorphs and Face Huggers are featured in the game and are the only well done aspect of the character design. Most of the characters (enemies and allies) resemble the “typical” Marine as well look similar to one another in facial structure and size. One positive aspect of this game’s presentation is the soundtrack and sound effects. They feel very reminiscent of the Alien film series, down to the authentic motion tracker sound effects, and make fans of the films feel right at home alongside all the homages payed to the original movies throughout the game. The dialog and voice acting are comical and poorly done, making it difficult to connect to any of the characters or even take them seriously at times. While fans of the movies may enjoy the subtle nuances added to the game from the films, others may not recognize them at all making for almost no redeeming qualities when it comes to the game’s presentation. From the reviews and footage I’ve seen from the game, all I have to say is: what a disappointment. I’m a big fan of Alien and Aliens, and I was so excited about it, but I should of been tipped off on it’s crappiness when it was originally going to be released in 2008, but got delayed. 2008. Sigh. So much hype, and it turned out to be just like Duke Nukem: Forever, a black hole of expectations and missed opprotunites. I agree, I loved the movies and had such high hopes for this game. Sadly, there was just nothing to it but flaws and poor quality. $60 out the window. That’s the price of reviewing games though, I suppose haha.